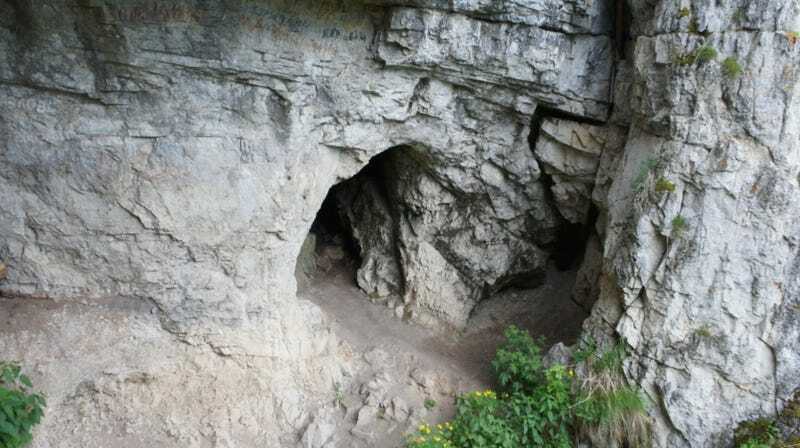 The entrance to the Altai cave where the Denisovan fossil was found in 2008. Genetic analysis suggests two populations of Denisovans—an extinct group of hominids closely related to Neanderthals—existed outside of Africa during the Pleistocene, and that both of these populations interacted and interbred with anatomically modern humans. Virtually everyone knows about Neanderthals, but very few of us know about their distant cousins, the Denisovans. These extinct hominids were only discovered 10 years ago, and what we know about them comes from just a single finger bone, a toe bone, and a tooth, found in Siberia’s Altai Mountains. We know so little about the Denisovans that they don’t even have a formal scientific name, though scientists are considering Homo sp. Altai or Homo sapiens ssp. Denisova. Indeed, as these names suggest, Denisovans were a branch of humans, having diverged from Neanderthals some 200,000 years ago. We know this because the Altai fossil yielded a near-complete genome, which scientists have been poring over since it was first sequenced in 2010. Replica of a Denisovan finger bone fragment. But in addition to the Neanderthal ancestry, genetic anthropologists also learned that Denisovan DNA lives on in modern humans, especially among Oceanians and East and South Asians. This means anatomically modern humans, or Homo sapiens, must’ve interbred with a population of Denisovans. But as new research published today in the science journal Cell points out, our ancestors mated with Denisovans on at least two different historical occasions. So the traces of Denisovan DNA embedded in the genomes of some people living today originated from at least two distinct Denisovan populations. To reach this conclusion, a research team led by Sharon Browning, a research professor of biostatistics at the University of Washington, compared the lone Denisovan genome to 5,600 whole-genome sequences derived from individuals in Europe, Asia, the Americas, and Oceania. To their surprise, the analysis hinted at not one, but two populations of Denisovans—one that lived in Oceania and one that lived somewhere in Asia. This image shows the two waves of Denisovan ancestry that shaped present-day humans. “What was known already was that Oceanian individuals, notably Papuan individuals, have significant amounts of Denisovan ancestry,” said Browning in a statement. “The genomes of modern Papuan individuals contain approximately 5 percent Denisovan ancestry.” Asians, by contrast, have less Denisovan DNA, so prior to this new study, scientists figured that ancient Oceanians migrated to Asia, where they spread their Denisovan-infused DNA among the native population. “But in this new work with East Asians, we find a second set of Denisovan ancestry that we do not find in the South Asians and Papuans,” added Brown. “This Denisovan ancestry in East Asians seems to be something they acquired themselves.” Unexpectedly, Denisovan DNA appeared to be more closely related to modern East Asian populations than modern Papuans. This study suggests that anatomically modern humans interbred with Denisovans very soon after leaving Africa somewhere between 200,000 to 50,000 years ago, and that this interbreeding happened in two pulses. Browning’s team isn’t exactly sure where these trists took place, but they suspect a southern group of Denisovans mated with the ancestors of Oceanians and a northern group mated with ancestors of East Asians. More evidence will be required to push this research forward. Interestingly, the same research also tells us something new about Neanderthals, who also interbred with modern humans. Previous evidence suggested humans got it on with multiple Neanderthal populations, owing to different amounts of Neanderthal DNA when comparing living individuals of European and Asian descent. But Browning found tremendous homogeneity in the Neanderthal sequences analyzed, leading them to conclude that early modern humans mated with a single Neanderthal population, and that the discrepancies seen in living Europeans and Asians in terms of Neanderthal DNA must’ve been caused by something else, like European humans interbreeding with other groups of humans, i.e. those coming out of Africa, with zero Neanderthal DNA. That’s kind of a shocker, and more evidence will be required to suss this out. In the future, Stringer said it would be valuable to put a time sequence on the various interbreeding events with Neanderthal and Denisovans. “Hopefully this will be possible one day,” he said. Anne Stone, an anthropological geneticist at University State University, thinks the new study “was really well done,” and was most surprised to see the researchers tease out the relatively small amounts of Denisovan-derived DNA segments and uncover the signatures of the two genetic mixing events. “Interestingly, they also find that modern human admixture with Neanderthals may have only happened once, rather than twice as some have posited to account for a higher Neanderthal component in Asia compared with Europe,” she told Gizmodo, adding that the study is helping us understand the extent of interbreeding among early modern humans and other types of humans outside of Africa. A huge limitation of this study, of course, is that Browning’s team had only one Denisovan genome to work with, and a partial one at that. We have no reason to believe that this single sample is tarnished or weird in any way, but it would be super helpful to find additional Denisovan DNA. The search continues, but as this study shows, human history is more complicated—and diverse—than we could have ever imagined.